The Beiter Compound Launcher is in our opinion the best blade launcher available to day, it is so easy to set up and if you do mess up or try something getting it back to where you started is a breeze. 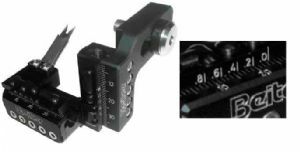 The fine adjustments both vertically and horizontally are un-matched in their accuracy and ease of use. This rest does not have any locking screws so a simple turn of the adjustment tool is all that is needed. The adjustments are smooth and spot on making tuning a simple process. Tests of the Beiter Launcher, were conducted at the world renowned Beiter Centre and using the Hooter shooter a device that can mechanically shoot a compound bow the same each time and the indoor 70m range with all its hi tech and video facilities adjustments to the rest of only mm's translated into arrow groups opening up. In fact a 1mm horizontal adjustment could be plotted to move the group from the centre of the target. Normally with a blade the blade will bend down as the shot is made, the recover and bend upwards by the same amount, slow motion footage shows that this can interfere with arrow clearance. The Beiter Blade is designed so that the amount of travel upwards is so small it does not interfere with the arrow flight. After you have bought your launcher register it with Beiter and the launcher comes with a lifetime warranty (the warranty is void if the screws holding the device together are tampered with). Currently availability is very limited we have sold out of our first delivery before it even arrived in the UK. Horizontal and vertical movement without any locking screws - The Rest can be adjusted without loosening or tightening any screw! The launcher can be set in 2 different angles - 30° or 35°- by changing two little blocks. So the angles can be re-set accurately. Stainless Steel 5/16“-24 screw with flat head and large diameter. The Spacer made out of a special plastic, which allows to fix the screw better. A counter screw with an elastomere pad avoids any marking on the bow handle.